Bar graphs show data from left to right using horizontal bars. The category axis, called the x-axis, is on the left side of the chart. The value axis, called the y-axis, sits at the bottom of a bar chart. 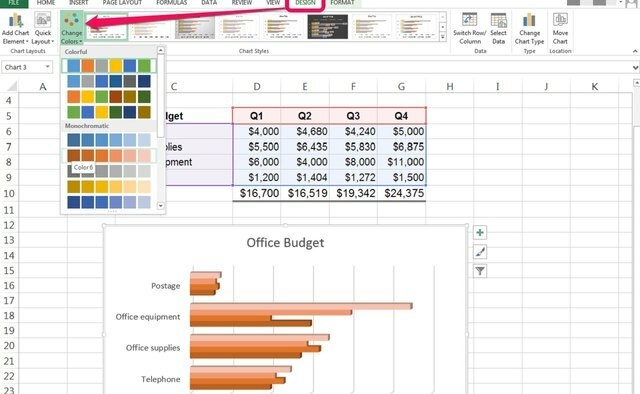 Excel 2013 calls these vertical charts Bar Charts, as opposed to the more commonly used Column Charts in which the x-axis is horizontal and the y-axis vertical. 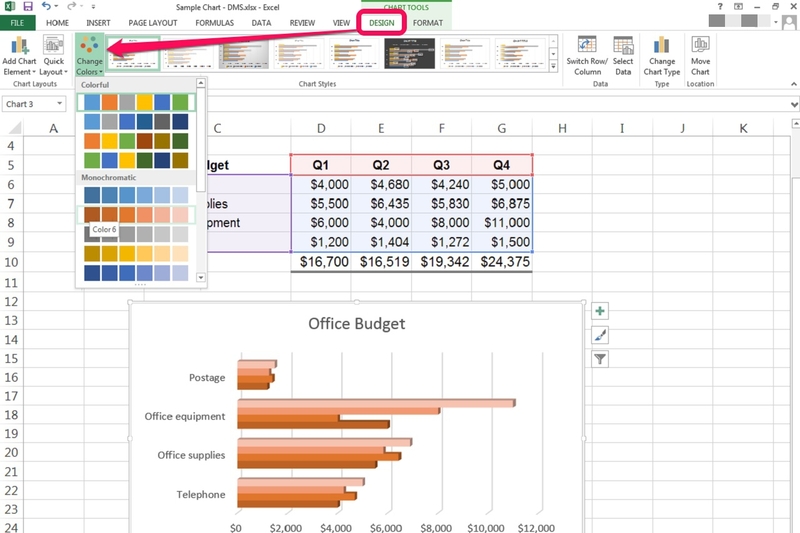 Adding graphs in Excel 2013 is as easy as selecting the data and choosing your preferred chart type from Charts grouping on the Insert tab. 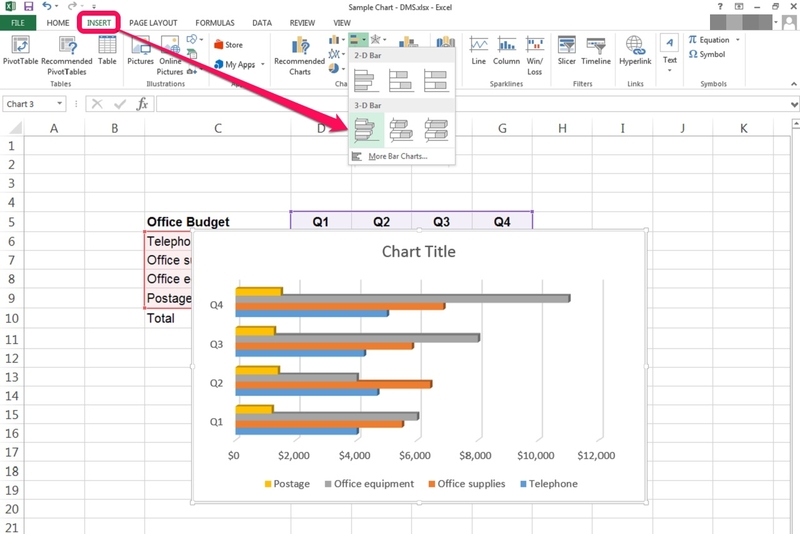 By default, charts embed in the active sheet, but chart location is simple to change. Select the data you wish to chart, including the headings. Failure to select headings affects chart categories, data labels and the legend. Click the **Insert** tab and press the drop-down arrow next to **Bar** in the Charts grouping. 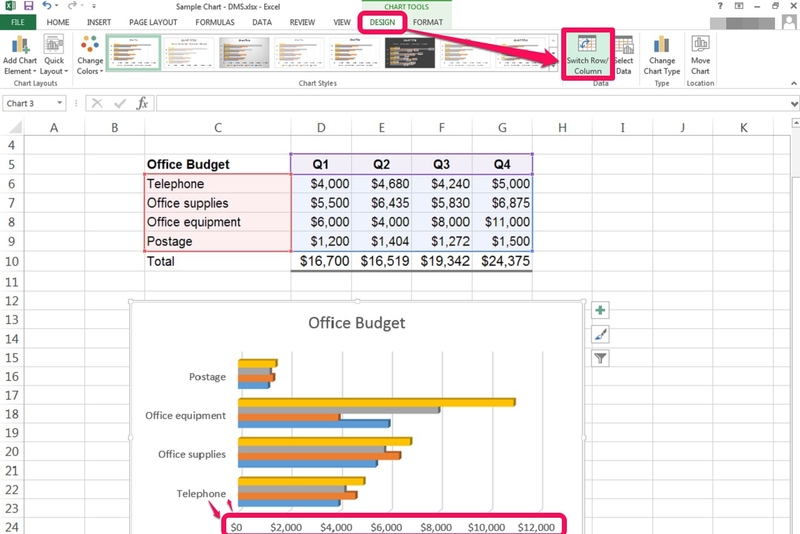 Pick the **2-D Bar** or **3-D Bar** option that works for your data. For example, if you're comparing groups of costs against one another, a *cluster* chart will show these groups next to one another as groups of horizontal bars. 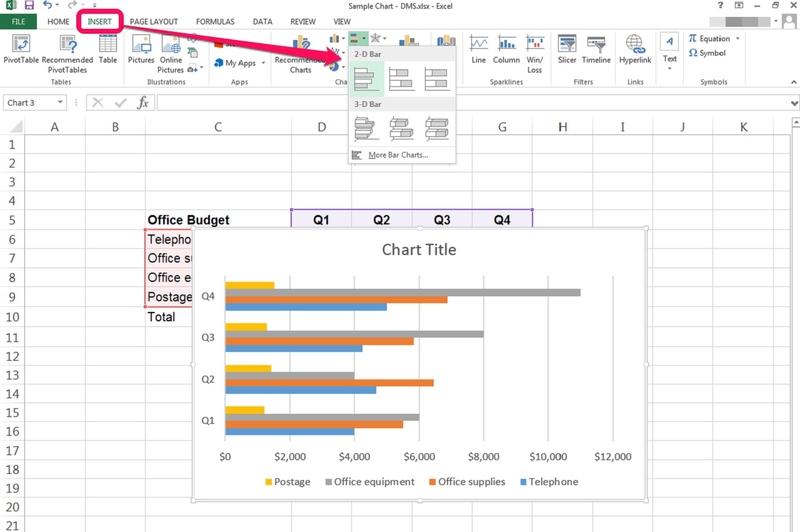 Drag and drop your chart object to the desired location in the sheet. Click anywhere in the chart area to modify the chart. A common change is to swap the data measured by the category axis. 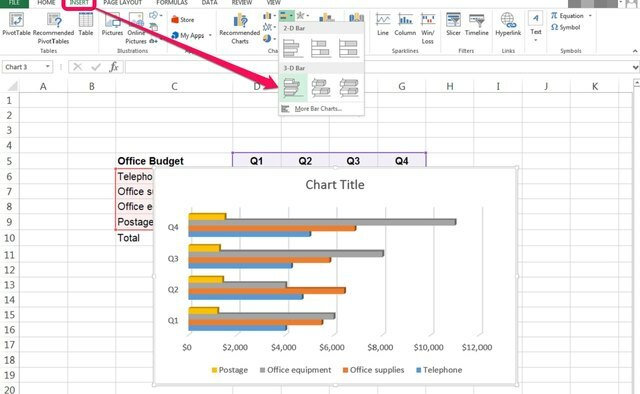 Select the **Design** tab from the dynamic **Chart Tools** that appear to the right of the View tab. Click **Switch Row/Column Data. ** The items in the legend swap with the items in the category axis. Click **Undo** to switch back. Changing the overall colors of bar graphs often makes them easier on the eyes. 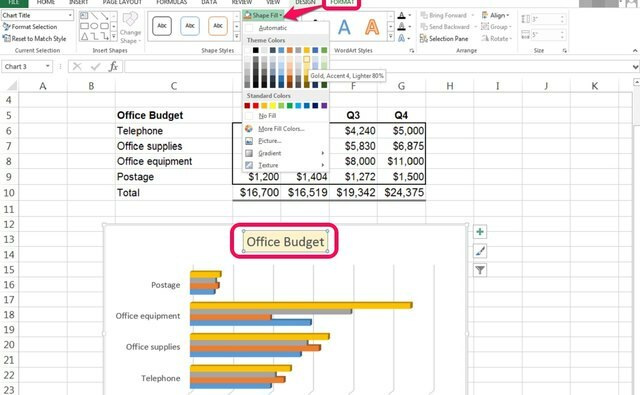 Select the **Design** tab from the dynamic **Chart Tools** that appear to the right of the View tab. Click **Change Colors** and choose a different color scheme. 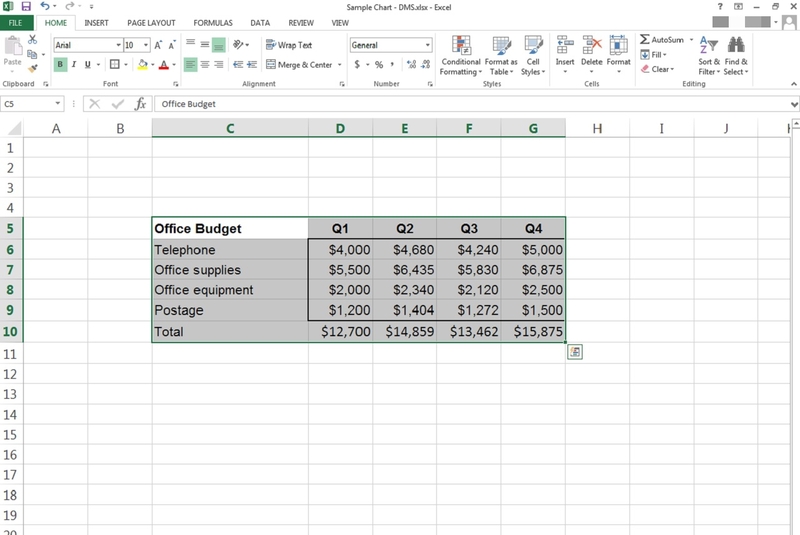 Formatting individual chart elements is straight-forward. * Click on the element, for example, *Chart Title* or *Category Axis*. * Select **Format** under **Chart Tools**. * Choose the style change you want, for example *Shape Fill* or *Word Art Style*. Double-clicking on any element in your graph opens the Formatting Pane for that element on the right side of your screen. Right-clicking is another fast method for quick formatting. 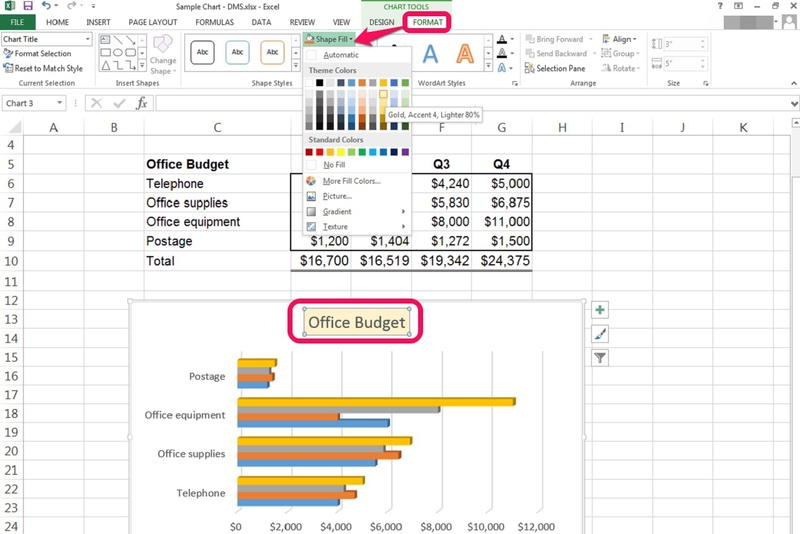 Clicking on any bar in a bar graph will select an entire series of data. **Be cautious of clicking more than once. ** Two single clicks will select a _data point_, rather than a _data series_, which means that changes were made to a single bar only. Save yourself the extra work by learning to click away from the chart and then back in when you select the wrong chart element.